"First up that Nurburgring lap. The target for the GTR was always 7:30 - and it had to be achieved in a fully representative 'customer-spec' car. Mizuno is quite clear on this: 'This time was set on a totally standard car, just like a customer will get. For us 'Time Attack' must be repeatable in a customer car. 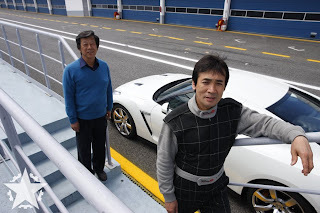 No special brake pads or cut-slick tyres - everything was standard GTR.' 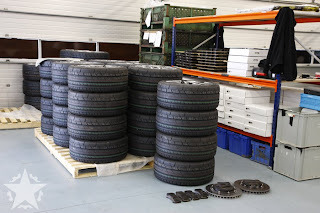 The time, set on April 8th, was achieved on the Dunlop SP Sport 600 DSST tyre that is standard on the basic GTR (i.e. non Premium or 'Black' spec, which both have Bridgestone RE070R tyres). The Dunlop is a little noisier and not quite as good in the wet as the RE070R, but in the dry it's worth 4-5 seconds around the 'Ring. Incredibly all the tests of the GTR in the UK so far have been on the slower Bridgestone - and yet it has consistently set faster lap times than cars like the GT3." Ok NAGTROC folk that were questioning if the Dunlop Sport tires were quicker than the premium Bridgestone tires. "Incredibly there's more to come. Mizuno, Suzuki and the rest of the team are already well into the V-Spec development programme. Both men are tight lipped about the project but with an increase in power (to around 550bhp) and a 100kg weight saving, the V-Spec should move the GTR even further ahead of its rivals. Suzuki thinks the car should be as much as 10-seconds quicker than the standard car around the 'Ring. However, the V-Spec will have more extreme track-biased tyres, which will account for a large chunk of the time saving." Vspec they want to be 10 seconds quicker. It will all depend on what the ZR1 does at the ring.